Turtle keeps a teapot full of ideas next to his bed so that he doesn't lose them. Most would use a notebook, but Turtle feels that keeping them in a teapot means that they have a chance to brew into even better ideas. For the perfect brew, Turtle steeps for two or three days maximum, no longer though, don't let those ideas stew! Beeeeautiful notebook from Notes from the Underground. Click the picture to visit Notes from the Underground. 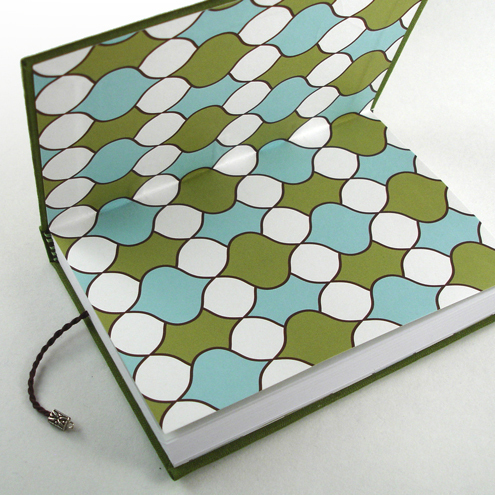 Exquisite fabric lined notebook from Butterfly Craft. Click on the picture to visit Butterfly Craft and have a look at the other beautifully made and embellished items. A mini recycled notebook from Rara Avis. Click on the picture to visit Rara Avis for lots of lovely recycled and upcycled stationery and jewellery.